These taro biscuits are similar to the BBQ pork buns, but with a different filling and cooking method. Once they are made, they can easily be frozen and reheated later for a quick and easy snack or breakfast. These biscuits can be made with or without sesame seeds, but the sesame seeds do add something to the taste and texture. In addition, they can be prepared using a variety of cooking methods. I used pan frying, but steaming and baking are two alternatives. In addition to a variety of cooking methods, the fillings can be changed to suit your preferences! Although meats can be used as fillings, it will be a bit more difficult to get an even layer. What are some of your favorite fillings? 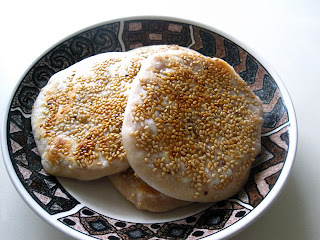 Sweet taro paste pan fried inside a flaky bun, topped with sesame seeds. Mix 3 cups of flour with one cup water, then add 2 tablespoons oil. Continue adding water as needed to achieve a soft, but not sticky dough. Cover the dough and let it rest for 20-30 minutes. Mix the sugar and mashed taro to desired sweetness. Form dough into a log with a diameter of approximately 1.5 inches. Cut dough into approximately 2 inch segments. Roll each segment into a circle approximately a quarter to half inch thick. Add approximately 1 tablespoon filling to the center of the circle. Pinch together dough, similarly to the BBQ pork buns. With the pinched together side facing down, flatten the biscuit, making sure not to push too hard or the filling will come out. Wet the top of the biscuit with water and dip it into the sesame seeds. Heat oil and spread it around the pan. Place biscuit on heated pan and cook until slightly browned on one side. Repeat with the other side.